Our experience in the design and manufacture of advanced passenger information systems (including real-time passenger information systems) for upgrade, refurbishment or new build projects is second to none. We also have the capabilities to design advanced technologies suitable for rail, metro, bus and tram systems. We have an extensive proven range of displays, driver or passenger user interfaces and audio equipment to create fully compliant and high quality real-time passenger information systems. Through our extensive experience in supplying EMU and DMU systems for a variety of new build and legacy rolling stock refurbishment projects, we are able to provide proven designs that require little or no modification for any particular rolling stock variant. Train to Shore GPRS communications backbone for message uploads, location tracking downloads and spare capacity for ADDT/OTMR data. 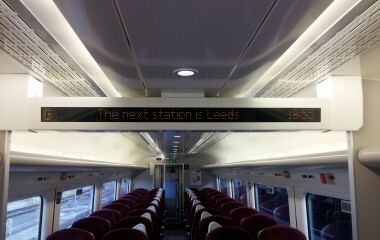 For more information on the trains our systems are fitted to click here.